Leicht und luftig Wohnung in Doppelhaus 2 stöckiges Haus mit geräumigen Wohnzimmer, TV und WLAN-Internetzugang, eine voll ausgestattete Küche mit Geschirrspüler, Waschmaschine / Trockner, Kühl- / Gefrierschrank, Herd und Mikrowelle für "zu Hause Bequemlichkeit. Ein Schlafzimmer mit Doppelbett, ein Kingsize-Bett und ein eigenes Badezimmer mit Dusche und Blick auf den Garten. Ein Doppelzimmer mit 2 Doppelbetten und ein eigenes Bad mit Badewanne. Sichere und freundliche Nachbarschaft mit Supermarkt, Café, Bäckerei, Blumenladen, und Wäschereien am Ende der Straße und Busse ins Zentrum von London in der Nähe. 7 Minuten zu Fuß zur nächsten U-Bahn, Ladbroke Grove oder Latimer Road. Zu Fuß zum Portobello Markt mit all seinen Restaurants, Bars und trendigen Geschäften. Eine U-Bahn Haltestelle zum Einkaufszentrum Westfield mit all den Designer-Läden. 10 Minuten Taxifahrt nach Paddington und Heathrow Express oder 40 Minuten mit dem Taxi zum Flughafen Heathrow. We are a family with two kids. The house is in a good neighborhood and it is close to tube (walking with kids aprox 10 minutes), the same distance to Portobello Market. Close to tube there are supermarkets. The house is clean and it takes all you need in holidays. A plus is the natural light in all the rooms. The owners are very kindly and helps you in order to stay comfortable both at home or visiting London. In the week that the Guiral Gil family stayed with us they were terrific guests, the kids were delightful and we hope very much that they will come and visit again! Bunty's and Ian's place was a terriic way to start our vacation. Before arriving, Bunty was great in communicating and in helping us with ideas on how to manage the Christmas holidays while were there. The place itself was easy to get to and commute from, being only a few minutes from two tube stations. It also had just enough within walking distance, including Portobello market and some cozy breakfast places to start our day. We were a family of five, including two teenagers so the two levels was also great for the kids' "moderate independence". Everything was clean and well maintained, and our hosts checked in on us before, during and after to make sure everything went well. The kitchen and main bedroom/bath are small but totally workable, and it was great to have the two bathrooms. The living room is so bright and airy and the perfect place for a larger family to get together at the end of a day of touring. This was our first home let experience, and we're so grateful to Ian and Bunty for allowing us to enjoy their home and generosity while we explored London. Thank you Milstone Family you were an absolute pleasure to have to stay - great guests who had a great trip to London and really enjoyed the apartment - we hope you will come back and visit again in the future. 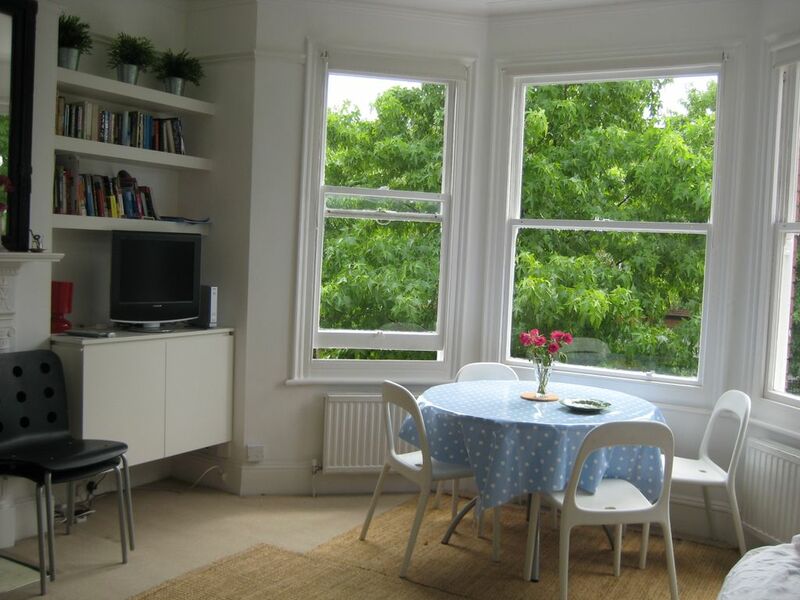 A very comfortable, cosy and welcoming apartment in a great location to explore London. Our family of five have just spent 10 days at Bunty and Ian’s North Kensington apartment. Bunty was most welcoming, greeting us on arrival, and the apartment was very clean, comfortable and warm (important for those chilly London days!) It was lovely also that they had taken the time to decorate the apartment for Christmas. It is really well located - we caught the tube every day from either the Ladbroke Gdns or Lattimer Rd stations, which are only a short walk away, and also caught the bus at a nearby stop to the amazing Westfield shopping centre at Shepherds Bush. There are many pubs an easy walk away. In particular, we had great meals at The Portobello and The Duke of Wellington. We also made several visIts to the fabulous Portobello Markets nearby. The apartment was a really great base for us to explore London from. Thank you, Bunty and Ian, for hosting us. Alison and family were wonderful guests and we loved having them in our apartment over Christmas. They are a friendly happy family who looked after the apartment and left it spotless on departure! Thankyou Alison! A ***** family of five! So glad they enjoyed staying with us and we hope if they return to London sometime we will see them again. Quiet location, loads of space! We have just returned home from a fabulous 5 day break in London staying in this lovely apartment. We were 2 adults, 14 year old daughter and 10 year old son. The layout of the property was perfect for us; a double bed and ensuite shower room downstairs and a very roomy attic room with 2 further double beds and ensuite bathroom upstairs. The kitchen had everything we needed to prepare breakfast before our day trips out (electric oven, microwave, toaster, kettle and dishwasher) and the living room was spacious, with a comfortable sofa to return home to after a long day of walking. Bunty and Ian were wonderful hosts and were there to greet us on arrival. The location, for us, was perfect - set in a quiet, leafy street away from the noise of the city, yet only a 5 - 10 minute walk around the corner to the nearest tube station which gave us easy access to the whole of London. We couldn't have asked for more and will definitely be staying here again on our next trip to London! Thankyou guys! You were great guests and we are so happy to hear you enjoyed your stay and we can’t wait to welcome you back! ***** guests! Quiet, cosy, apartment in a great neighborhood, with cafes, restaurants, groceries, etc very close. Cosy 2-bedroom, 2-bath in a nice quiet neighborhood. Everything you need for a longer term stay is provided. The owners, Ian & Bunty, were very helpful with local information. Would recommend staying here as a good home base fir a visit to busy London. In der Nähe von Parks, darunter neuen Wasserpark für Kinder.